FontPress is little, yet powerful, typography tool to easily empower your theme, virtually managing any font. This with the ability of mixing together Cufons, Google and Adobe Edge web fonts, Adobe Typekits, @font-Face fonts or simple CSS fonts! The plugin supports also new Google Early Access fonts for non-latin languages! Add or just select the fonts you want to use. Create global rules and eventually concatenate them. Create custom text blocks without any CSS knowledge, simply using the typography shortcode. 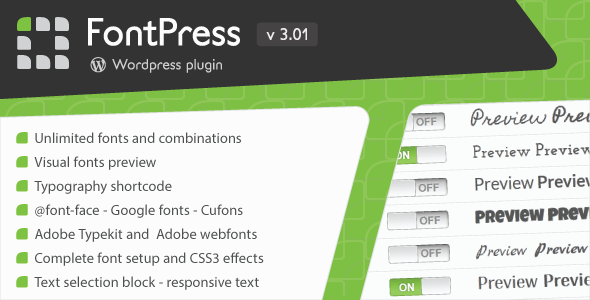 FontPress comes with an handy wizard, turning complex tweaks into few clicks! There are many plugins letting you use custom fonts, but FontPress adds an essential extra to project your changes. It shows font previews in all their formats (standard, bold, italic, bold italic). Forget to guess which character is hiding behind a name! Managing responsive contents is often a real hassle: hours lost writing heavy codes. FontPress could be a real time saver in these situations, featuring CSS3 responsive units for font size and line height. Don’t you know what CSS selectors are? Visual builders could be a great opportunity for you. Most elements give you the ability to add a specific class or ID. Will be a joke to use FontPress rules then. Optimized and highly targeted code without any knowledge or error margin: simply great!